click to watch a video- Jesus is a WINNER MAN! DAY 3: We started off the day as a team walking through the streets of Sangre Grande exploring the culture, the stores, and the over all feel of the town in which we soon hoped to connect with. In our groups we attempted to speak to the people we saw, understand the things around us, and connect with each other. It is always a blessing to be able to multi task the way that we do here by, at it simplest, fellowshipping and worshipping while we complete the tasks at hand. Our pale skin has been a major give away these few days. Everywhere we go we get looks but of course we have loved it and have taken that attention as an opportunity to connect with and relate to the locals. After our prayer walk we ate a delicious home cooked meal at the Heerahs house and soon changed into our swimwear. We spent a few hours on a local beach and had a grand old time. I have been personally so encouraged by the way that in whatever we do, we do it as a team. We played Marco-Polo the majority of our time there and I so appreciated the participation of the entire team as well as some new friends we made that day. After some major fun and fellowship we began an evening of sharing in the community. Our American team split up into groups of three or four including some extraordinary Trinidadian help. We went our separate ways within nearby neighborhoods and went house to house asking locals questions from a survey with the intention of not only having a greater understanding of the needs around us, but also to interest people in Hope Community Church and ultimately the gospel. These kinds of surveys were very different from what most of us were used to simply because the Trinidadians here typically enjoy sharing with us and getting to know us, whereas in the states most of us are used to being brushed off. Talking to strangers with thick accents and strong opinions was certainly enough to stretch most of us, but at the end of the day we all took joy in what God had done in us and through us. God gave us the chance to be bold and to lead for the sake of the gospel, for which we praise Him. We ended our day sharing about our experiences sharing at a local Chinese restaurant after which we ended our night exhausted and ready for some sleep. Please pray for the families we talked to: that our conversations would encourage them to seek out the one true God. Ronnie was so encouraged to see us talking to the neighbors of the church. We really are hoping to be an encouragement to the church and the community. DAY 4: Tuesday morning we woke up earlier than days past, frantically getting ready for the busy day ahead of us. Skits were being practiced, things were getting packed, and much prayer was taking place as we headed off for Guaicu Presbyterian Elementary School, where we were given the opportunity to put on a program for the children attending there. Ryan Swisher passionately led some worship for the kids, followed by Ronnie to sang children’s songs including Jesus is a Winner, Man, a personal favorite of mine. We performed King of Hearts and maybe it was just me, but I believe that we all felt the spirit of God strongly in that room as every character and idea was depicted. The children laugh, gasped, and erupted in applause (most graciously, I may add) as we performed and later explained what the skit meant and how God had reached us personally just as he reached the characters in the skit. Considering the room was enormous and packed tight with various aged children, the attention overall was focused in on us and our message for them. After performing the team was given some time to get to know the kids and simply show them the love Jesus would have us show. Many kids begged for autographs, compared us to Disney characters, and asked if our eyes were real. We could not help but laugh at the silly things they said to us but when we left something in our hearts stirred. We barely knew these kids, but each of us was sincerely sad to go. After our time at the school we headed out to a work project where a house was being built for a single mother who Ronnie was connected with. I doubt any one of us had ever sweat that much in our entire lives. Every team member worked like crazy digging trenches and priming walls in the heat. It was encouraging to see the progress of our labor as time went on. Our work there is not yet finished, but we plan to return tomorrow to finish painting what was primed today and help assemble the roof for the house. After eating some traditional Trinidadian roti for lunch, we hoped to work even longer on the house, but frequent rain showers prevented us from being able to do any real work, so we took that as God calling us elsewhere. We had some team time back at the house followed by individual and group Quiet Times. Although it rained off and on all evening, nothing could stop us from doing more surveys! Because it was our second time around, conversations seem to run smoothly and go further than they had the day before, and for that we are thankful. We ended the day with perhaps the most fun activities in the world: eating food and singing karaoke! The restaurant we ate at is called Sound Bites Caf and is owned by a Christian family, who we thoroughly enjoyed spending the evening with. The food was delicious and the company could not have been better. We were encouraged to sit by team members we knew the least and from that grew some real friendships, or rather deepened the friendships that we have already formed. Karaoke also brought us closer together. Anyone willing to put themselves out there for the sake of bonding and fun is worthy of respect. The evening could not have gone better. We rode back to our living areas singing songs with contentment in our hearts; ready for whatever God will have for us tomorrow. Please pray for our Street meeting tonight! We will be sharing our package and witnessing to those passing on the street from a small parking lot. Pray that Gods message is communicated clearly and that He will be working on hearts to the benefit of His kingdom. Below is a post of our first two days. There are more pictures on yesterday’s post and attached to this post are two videos…enjoy! Our day of travel was indeed a long one! The team piled into Dulles Airport around 4am half-asleep, but one hundred percent eager to begin our adventure ahead of us. We praise God for a day of nothing but safe travels and blessings. Not a single piece of luggage was lost as we flew from Dulles to Miami and then to Trinidad. How incredible is it that we serve a God who not only got us where we needed to go, but He got us their quickly, safely, and with everything we could hope to bring. I must say it has been neat to see God’s fingerprints so clearly marked over every individual that makes this team a team. It is so obvious to us all that God chose this team (every member included) for His great purpose and we have been able to accurately rejoice in that as we have begun to work alongside each other and get to know each other. Every plane ride was taken as an opportunity to get to know each other on a deeper level as well as sharing with other passengers about our mission ahead and our great desire to see God work in us. The team then joined up for a get-together at Hope Community Church to meet some of the people we will be walking alongside this trip as well as eat some fantastic Trini food for dinner. It has been an honor spending time with everyone we have met thus far. Hope Community Church is not flashy or edgy, but its members are filled with more love, life, and joy than I can even describe to you accurately with mere words. Their love has overwhelmed the hearts of this team and not a single member left the church last night without excitement in their souls. One incident in particular reminded us of God’s provision: After the Maxi Taxi (our daily transportation in a bus/van) dropped everyone off at their locations, we realized that there was some key items left behind in the vehicle. In the process of retrieving it, we got to meet the closest neighbor to the church and show an interest in her family’s lives (her daughter is miraculous alive after having spinal bifida for years. The doctors say she should have died when she was 5… she is now 14!) The family is not connected to the church but we are hoping this interaction, along with others will show her God’s love and the love of the church she lives next to. The team started its day off today heading back to Hope Community Church for a bit of “Trini Culture Training.” As a group we listened to a well-put together presentation by about the history and culture of Trinidad so that we may be able to reach out to the community in a relevant way. Ronnie spoke to us briefly about the missions statement of the church and spoke profound truth into the meaning of God’s hope, leaving us encouraged and excited about beginning God’s good work here. We went over, in detail, our plan for the next two weeks so as to be prepared for everything that is coming our way. We are learning to be flexible and roll with the punches, because the Trinidad culture is not a rushed or planned one in the way ours is in the states. Our new favorite phrase is “Trini Time.” For example “you can have a five minute break…Trini Time,” which meant that fifteen minutes later our break ended. After discussing our game plan, the team set up the church for a discipleship time and regular church service that happen Sunday evenings. We ate lunch together as a body of Christ and continued to use our time wisely by practicing skits, worship songs, and taking the time to encourage and exhort one another whenever there is down time. Finally we ended our time at the church today by having a quiet time together as a team and fellowshipping in all that God shared with us. After a nice refreshing couple hours back in our respective “homes” we arrived at the church for the services. We did one of our skits and sang a couple of our songs. Allison shared her testimony and Bob gave a message. Eight of us had chances to help with childcare. The guys also got to build friendships with some younger guys that have been checking out the church. We had a great dinner and fellowship “liming” with the Trinis from HCC. Another area we hope to see God working is in our driver’s dad’s life. His dad once said he would never step foot inside a church. God has definitely been softening his heart. He is going to take on the transportation of us with his son and has been in the church since we got here! Pray that he continues to be receptive to God’s work. We made it to Trinidad safe and sound and all of our luggage made it too!! Thank you for your prayers…we really appreciate them!! We are exhausted after a long day of travel but will hopefully post more fully tomorrow morning. We are definitely not in Kansas anymore but we are excited for what God has planned for us during these next two weeks! As believers we have all heard of the Holy Spirit, but how many of us really understand who He is or what He practically does in our life? Christ Himself says it is for our benefit that Christ leaves and sends the promised Holy Spirit (John 16:7). We are told if we walk in the Spirit, we will not gratify our sinful desires (Galatians 5:16). We hear about the Fruit the Spirit (Galatians 5:22) should develop in our lives of love, joy, and peace and want some of those, but how do we get them? We hear about living in the power of the Spirit, but far too often tend to lead defeated Christian lives. This year at our our annual Youth Summer Camp, we will be learning about the Holy Spirit and what He does in our lives. With that in mind, our theme this year is SUPERnatural. Not supernatural in the Ghostbusters way of thinking, but as in SUPER (adj. – above, beyond, stronger than) natural (n. – the way things exist in nature without interference). Thisis about the power and work of the Holy Spirit in our lives. On my own, I would not walk with God or honor Him, but thankfully He has not left me alone as an orphan (John 14:18). He gives us the power to live beyond our own natural abilities. Please be in prayer that our teens would understand the role of the Spirit in their lives and experience His power to transform us. Summer Camp is open to all current 6th graders through those who just graduated from High School. The regular registration deadline is this Sunday (6/19). For more information click here. In the Jr. High Ministry of Reston Bible Church, we desire to create fun, safe environments where our teens feel comfortable inviting their friends, and the Gospel and the truth about Christ is clearly presented. This is why we hold our monthly Friday Night Lives. The activities vary each month from our own version of the game show “Minute to Win It” to a Photo Scavenger Hunt, and we use these themes to bring in the Gospel message. On March 25th, we had a Photo Scavenger Hunt, where the teens went out in teams and needed to take specific pictures of themselves doing anything from smearing ice cream on their faces to pumping gas for a random person. The video below highlights some of my favorite pictures from the night. After we took the pictures, we came back to the church, ate lots of pizza, and talked about the things we are searching for in life. We can look to success, friends, relationships, athletics, academics, etc. to give us value and purpose, but ultimately what we are looking for in life can only be found in Christ, the one who has searched after us. Please be in prayer for the teens that heard about Christ for the first time that night. This Friday, April 15th, we are having our next Friday Night Live. We will be playing capture the flag and some other fun outdoor games, have a bonfire with s’mores and hot dogs, and just enjoy a fun night together. Below is a parody video we made to promote the event with pictures from the fun we had last year. While these events are primarily designed for Jr. Highers, we would love the whole church to be involved. If you are a parent of a Jr. Higher, please encourage your teens to invite their and explain the event to their friend’s parents. If you know a Jr. Higher, all are welcome. If you see a Friday Night Live in the bulletin, know that they are designed for any Jr. Higher to come. If you are interested, in volunteering, please contact Aaron Osborne. Above all, please be in prayer for the many teens that will come and hear what Christ has done for them by dying on the cross for their sins to restore a right relationship between them and God. This year’s First Fruits took place on Saturday, November 20. First Fruits is a service project that has rallied the RBC church body for over 20 years. It is a unique serving opportunity for families, shepherd groups, and individuals to come together and make a difference in the lives and families of others in our area who are in need of help and encouragement. You may have heard the numbers in church. By God’s grace we had over 400 volunteers spread over 27 teams, doing more than 120 jobs (including some random acts of kindness), that raised $31,500 for families having a tough time financially in our area – 59 families in particular were blessed this past weekend. The numbers are truly amazing. But, First Fruits is about so much more than the numbers. The body of Christ was in motion like I haven’t seen before at RBC — working together, getting out of the salt shaker, and encouraging families in our area. I love how each year First Fruits brings together people that start out as strangers or acquaintances early in the morning and end as friends in the evening. This year was a particular blessing because Pastor Salvador Medina and 10 members of his congregation (from the Spanish Church that also worships at RBC) joined in and helped out during the day. They also played a key role with team visits to 3 of the Spanish-speaking only families in the evening. There is one body, but many parts (1 Cor 12:12-28) and it was neat to see this in action on Saturday — how, by working together, we were able to do more than any part could have done separately, even overcoming language and culture barriers and planting seeds that we hope and pray will yet bear fruit. It will be exciting to see how the Lord will use the relationships started at First Fruits both within the body and within the community to advance His Kingdom. The Medinas have already invited several of the families to come to church. I also loved seeing our teens getting out of the salt shaker. This happened throughout the day, and there are many stories. One captured it well for me. In particular, one Sr. High teen shared how she and some friends went to the neighbor’s house of the job they were working on to help the woman take care of her yard. They discovered that her husband had died 2 years ago and and she was diagnosed with breast cancer soon after. They were able to minister and pray with her in ways they could not have imagined when they started the day. A family of 12 living in a 3-bedroom trailer with another family. Two RBC regular attenders are a big brother and a big sister to 2 of the children in the family. Nineteen families attend local Sterling public schools that serve some of the most economically disadvantaged in the area. All the children in these families are on the free lunch program. The father/husband of one of these families died 2 weeks ago leaving his wife and 5 children behind. The Women’s Ministry is already continuing with one of the schools a partnership started through First Fruits and we hope to continue to partner with some of the others through Backpack Buddies and tutoring. At least 6 families have been, are, or may soon be homeless. One family just moved into their own apartment after being in a shelter for the past year. At least 8 families (includes RBC attenders) are struggling with unemployment and being underemployed. Many do not yet know the Lord. The First Fruit gifts brought tears, smiles, hope, and prayers of thanksgiving. Please join us in praying for these families and thanking the Lord for the amazing team captains and co-captains that led the army of 400 workers who blessed so many. May God alone receive all the glory. Lord, when did we see you hungry and feed you, or thirsty and give you something to drink? When did we see you a stranger and invite you in, or needing clothes and clothe you? When did we see you sick or in prison and go to visit you?’ “The King will reply, ‘I tell you the truth, whatever you did for one of these brothers of mine, you did for me. 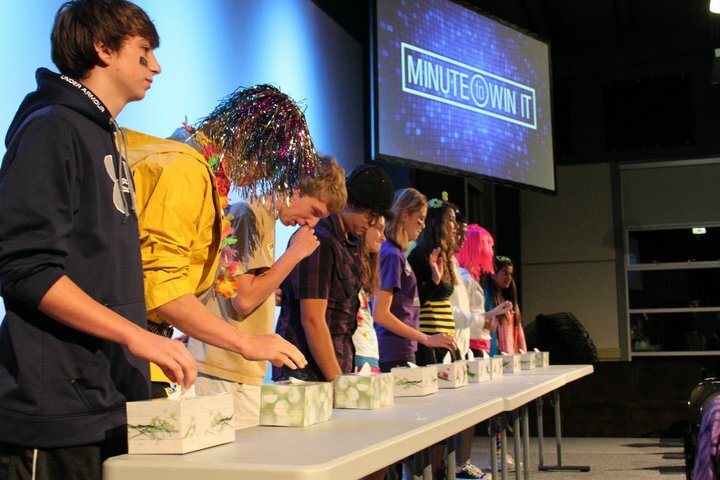 Back in October, the RBC Youth Ministry hosted “Minute to Win It” over the span of two evenings – one geared for junior-highers, the other for senior high students. This event, based off the popular game show, was a big hit with the teens and their invited friends. The game show host was Erik Palmer, who fit his role well. Besides 12 challenging 60-second games, those who attended were treated to pizza, raffle prizes, cash prizes, and powerful testimonies by fellow teens. 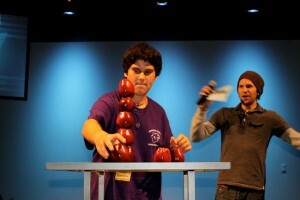 As on the TV show, each challenge was created using household items. Everyone had an opportunity to get on stage and win. Over $500 in prizes were given away. Contestants were chosen by raffle, at random, or based on their creative costumes. Do you think you might have had a chance of winning? Try stacking five Red Delicious apples on top of each other in one minute! On Friday night, junior-highers got to hear Mason Nalle share his story of going through three open-heart surgeries before the age of 17. Amy Stegeman then shared on Sunday night to the senior highers how she tragically lost several of her siblings and a friend by the time she reached 8th grade. A minute is all it takes for someone to lose their life. Following the testimonies, a pastor shared of God’s love and sacrifice and invited the attendees to a relationship with Jesus Christ. Several students indicated that they accepted Christ as their Savior that night. Praise our God! Knowing Christ and making Him known to teens is what this youth ministry is all about. 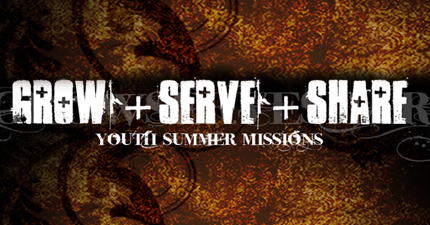 Pray for the staff as we follow up with them, and other teens that have expressed interest in knowing more. As RBC settles in to our new campus in Dulles, VA, several things have changed in the Jr. High Ministry (6th- 8th graders). Now that there are separate Jr. High and Sr. High rooms, both can meet during the 11 am service. With the new location and time also comes a new name – BreakThru. While the Jr. High years are a key transition time in a teen’s life where they are starting the process of “BreakingThru” from a child to an adult, they are also foundational years in their walks with the Lord. In Jr. High, teens have the capacity to understand the truths of God, but for the most part are not yet being challenged by all the trials of the world. This is why the vision for the Jr. High ministry comes from Matthew 7:24-27. In this passage, Jesus says that anyone who Listens to His words and Acts upon them is like a man who Builds his house upon the rock. That house stands firm even when the winds and the rain come and slam against the house, because it has a solid foundation. But just like laying the foundation for RBC’s new facility was hard work, laying a solid foundation in our lives is no easy task. You have to cut down all the trees and brush. You have to dig down through the loose topsoil. You have to BreakThru rocks and boulders in the way, till you can lay a level foundation on solid ground. In the same way, we want our teens to Listen to the Word and begin to Act upon it, and in this process they are building a solid foundation for their lives on God’s Word and His wisdom. If you are a parent of a Jr. Higher (6th-8th graders), we would love for you to join us on September 5th during the 11am service in Classroom 3 in the Youth Building, for a meeting where you will meet other parents, get a clear overview of what we do and why we do it, and experience a little of what your Jr. Higher does each week at BreakThru. We look forward to helping your teen lay a solid foundation for their lives on the rock of Jesus Christ, so they can be prepared for lives of knowing Christ and making Him known. Thank you so much to the many who faithfully prayed for the Croatia team this year. God definitely used your prayers in and through our lives. Personally, I saw more prayers answered in our two weeks there than I have seen during any period in my life, and each of you were a part of that. There were impending storms that threatened to cancel the baseball camp that never dropped more than a sprinkle. There were times when we were exhausted, but suddenly got another wave of energy to continue ministering. Our plans were constantly changing, but God was constantly providing. We thought we would just be planting seeds, but got to reap a harvest. Whatever number of kids we prayed to come to our camps, we got double. Some of the most significant desires that teens have today are to be loved, to have a close friend, to be accepted by their peers and to be affirmed by their parents. Yet even in our Facebook and texting generation, many still struggle with loneliness and the lack of real personal connection. The Bible talks about how we as believers are to relate with each other and calls it fellowship. Chrisitan fellowship is described as being so real, so genuine and sacrificial, that even the world would see it and take note. Our teens also deal with a sense of isolation and loneliness at times – even when socially networked with many friends and even when surrounded by Christian peers. Something is missing! If we are going to understand biblical fellowship, we need to see it in its proper context. Only then can we truly “get” our need for each other and the commitment we are commanded to make towards each other. That context is that we are in a war; there is a battle going on around us, and we are on a mission together, as a team. If we understand this, we can no longer love at a distance but by necessity. At summer camp this year, we will be using the backdrop of the military where the mission determines the relationship and creates what is called a “band of brothers.” Soldiers intuitively know why they need each other, why they are committed to “have each others backs,” “to carry one another’s burdens,” to “leave no man behind.” to “fight shoulder to shoulder.” That is the vision of fellowship that we want our teens to taste and to experience. At camp we will also be doing a number of things to help us grow in our mission and in coming together as a team. In the beautiful Appalachian mountains of West Virginia, our teens will have the opportunity to ride the white water of the New River and to rappel down the rock walls that border it. They can tube on Lake Stevens, battle it out in a paintball game, take on the high ropes course, hike the woods, take in a round of golf, or work on as a group on team building challenges. Our hope is that this WILL be the best week of their summer! Our prayer is that God would begin to change each of us during this time in the way we love each other in the youth ministry, in the way we to unconditionally care for our friends in the world, and in the way we sincerely love our family at home. When we choose to engage in the mission God has given us together, we will more clearly see how we need to love one another, exhort one another, and bear each other’s burdens. May it be said by others, that we are devoted to one another and may they see the love of God that is the reason we do. Praise the Lord for His great blessing this year with Spring Clean 2010. Spring Clean is one of the major ways that RBC youth raise funds each year for summer mission trips. The Spring Clean 2010 was Saturday, April 24th, and we had 190 volunteers come out to work on 57 jobs doing everything from spreading mulch, mowing grass, raking leaves, repairing fences, hauling wood, planting flowers, washing windows, staining decks, cleaning out garages, and even some interior painting. Together, the teams raised $20,000 for their mission trips to Brazil, Croatia, Chicago, and East Asia. Despite a wet forecast, the Lord also provided cover from the sun and held off the rain until after the teams were back. Earlier this month, the Jr. High held one event “to rule the them all”: Friday Night Live – Star Wars vs. Lord of the Rings. At this epic event, we enjoyed Yoda Soda and Eye of Sauron Cookies, played games with light sabers and Legolas’ bow, thought we were in the “Cantina” with our cool Star Wars Band (Pollock), reviewed lots of trivia from the movie, and watched a few exciting scenes from the movies, all in crazy costumes. As part of the evening, we also looked at some Biblical truth we can clearly see in the movies. First, sin promises to solve all of our problems, but in the end just destroys us. Just like Adam and Eve were seduced to eat the fruit by the temptation to become like God (Genesis 3:5) which led to our spiritual and physical death, Anakin was drawn to the Dark Side by his lust for power and the promise to save his beloved Padme, but in the end he burns in lava and becomes the more machine than man (Vader). Similarly, the Ring leaves in its wake a path of deception and destruction, as Smeagol is drawn by the beauty of the Ring and the identity he finds in “my precious”, and Boromir desires the power of the Ring to defend Gondor. However, in the end, the seduction of the Ring leads to both of their deaths. We see this same truth in the world around us and in our own lives. We must be keenly aware that sin is constantly lying to us and promising solutions while really bringing destruction. The wages of sin is truly death (Romans 6:23). Second, we looked at how sin corrupts and tempts us all. We read in the Bible, “All have sinned and fallen short of the glory of God” (Romans 3:23), and clearly see this truth with the Ring. All characters who come in contact with the Ring are drawn to and seduced by its power. The whole “Fellowship” starts because they each know that they cannot be trusted with sole possession of the Ring; however, it breaks up because they each know their behaviors are not safe around the Ring. Even Gandalf turns away in fear when he is offered the Ring because he knows he cannot handle its temptation. As we look into our own lives, it is clear that sin is something we each face daily and will continue to face until eternity. Finally, while the first two truths are kind of depressing, we have seen the end of the movies and know that a Savior always comes. When it looks like Vader will blow up Luke’s X-Wing, in comes Han Solo in the Millennial Falcon. When the Battle of Helm’s Deep seems lost, Gandalf comes in with the Riders of Rohan. After Obi-wan and Anakin have been defeated by Count Dooku, Yoda pulls out his light saber. And even though Sam can’t carry the Ring, he can carry Frodo. In the same way, “just the right time, when we were still powerless, Christ died for the ungodly…God demonstrates his own love for us in this: While we were still sinners, Christ died for us.” (Romans 5:6-8) Especially as we reflect on Easter, praise be to God for sending His Son, because without Him we would be hopeless. At the end of the evening, we voted which series was more epic. In a vote even closer than the 2000 Presidential election, Star Wars won by two votes, even after a full recount. So if you are ever in a debate as to which is better, the decision has been made. Many thanks to Pollock (Jesse Trask’s Band), Jason VanDorsten, Aaron Reed, Catherine Wilson, Sarah Jarvis, Elizabeth Johnstone, Kelly Hack, Mason Nalle, John Lyver, Denna Zimmerman, and the many others who helped. Please be in prayer for the six Jr. Highers who indicated decisions for Christ that night.